Previously written a few posts on my strategy for dealing with proposals, deposit and overall payment breakdowns. Over the last few years I have tried a number of permutations of the above with various changes made to the amount of the initial deposit and final payment etc. I think I have, at last, found a formula that provides flexibility, peace of mind for both designer and client as well as overall fairness for both parties. I have been using the method you see in the image above for nearly 8 months now and I have had no reason to change or tweak it other than the variables in the breakdown. So worth noting first of all: offering a client the opportunity to pay the full amount up-front with a nice little incentive has proven to be a really popular part of my payment breakdown. A number of clients have opted to pay the full invoice, ranging from £1000 to £4000, without any hesitation whatsoever. This has really proven to be quite heartening and encouraging. It shows utmost trust from the client as well as showing their faith in your ability to full fill your end of the contract. Receiving full payment also means you can now focus 100% on the project without those nasty little doubts and concerns about asking for future payments from the client for work completed. Totally removes all the anxiety that can prove quite the distraction during the course of a logo design project especially the longer and more challenging ones. For the clients wishing to opt for the traditional “here’s some now and there’s some later” it still provides a few options for them to consider. The part that really works well for me has been the addition of the Progress Payment. This solves a number of issues that I have come across in the past. It’s main purpose is to provide a mid way goal for me to aim for, rather than being daunted by overall project completion. It’s like a little, “well done for finally figuring out a logo design direction”, bonus. I know that the client will not pay the next installment until they are sold on the overall direction. Once they approve that idea/direction then this Progress Payment is made which also signifies their approval and commitment to the project. Should the logo design project touch a few months in duration then the Progress Payment also provides me with a much needed cash injection mid project so I can better keep my own personal financial affairs in order. The Progress Payment is the client approving your proposed overall design direction, and typically comes in at about half of the remaining balance: usually round 25% of the total budget. Once the Progress Payment has been made then I am able to focus on this design direction and get going on finalizing and polishing this idea. The Final Payment simply means that the logo design is complete, but not necessarily the entire project. If the client requests the complete logo design files before I have finished completing additional identity elements then the Final Payment is still requested. At this point I clearly communicate that final payment does not mean I simply walk away, but that it just secures the passing over of the logo design copyright and digital files. I will be working with the client until the ultimate conclusion of whatever other identity aspects are still needed. No final payment then no logo files. Although on some special occasions, depending on the overall relationship with the client I may bend the rules. Just to note that the Holding Payment is simply a small deposit to secure the project into my schedule if the actual start date is a few weeks or months away. A few times I have made provisions for a new project to start in a few weeks, but only to find out the client has gone elsewhere without telling me, and in this time I have turned down other work on the basis my schedule is booked. The Holding Payment is a small token of the clients intent to commit to the project which provides me with a little bit of security without asking for a full-on large initial deposit. You’ll notice that the proposal is a preliminary variety. I do this so that the client, if they feel the overall payment structure is a little hard from them to stomach, can approach me with some possible changes. This is not to say I will do whatever they want, but it does mean I am open to making some tweaks to the overall payment ratio. I have a big white line that I will not cross, and on occasion I have walked away from a job because the client feels my payment method is far from reasonable. 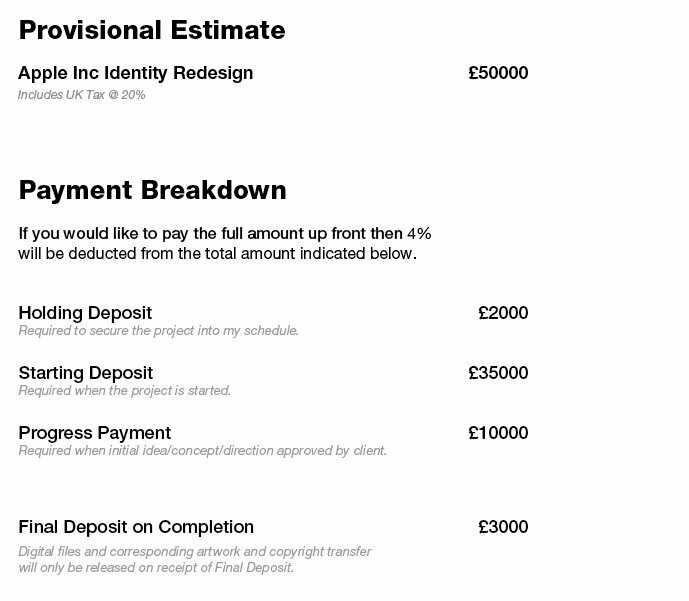 This included a very recent £4k logo redesign project because the client refused to pay 50% deposit up front. The Progress Payment can be worked a few ways depending on your own work flow or level of trust, or mistrust. I feel it’s important to communicate that it;s not just about getting more cash from the client, but that it really does add an extra level of motivation for the designer to keep on target both creatively and financially. All of which is a major plus for the client. No creative progress? Then no progress payment. I have a few useful logo design related downloadable templates including a logo design proposal template amongst a few other handy templates.